I’ve missed my alligators — but I’ve returned to their land, and in their honor, another devoted post! I’ve equally missed my poor Serenity Spell, due to a trip to the northern climes, a new OS on my lifeline laptop, an installed Photoshop, thanks to a dear friend (I now know how to insert my copyright…hoorah! ), and a new watermark — courtesy of my gracious friend and skilled web designer Richard Yartlett. On the night that Isaac roared into Florida (as a Tropical Storm) with its torrential flooding and high winds, one of the resident gators at our protected wetlands became a proud momma. She had fiercely protected her nest (or mound) throughout the 65-day incubation period, which she alone built out of vegetation, sticks, and mud in a sheltered spot near the water. She had laid her 20-50 eggs and covered them under more vegetation, which heated as it decayed, serving to incubate the eggs. If a mother alligator is killed or removed, she can’t protect her nest or young — and the hatchlings are doomed. Leave wildlife alone! The hatchlings were welcomed to quite a world! It was an eventful night, with brilliant and incessant lightning, high winds, and downpours to impress even the most hardened native Floridian. Two weeks later, I spied the proud momma and her myriad babies. I was thrilled — I often see baby alligators, and obviously many adults. And I see them together…. But to see them intertwined is difficult — usually, the mother keeps a watchful eye on her babies from a safe distance. Hatchlings are 6-8 inches long, and are near-replicas of their parents, save for a series of yellow and black stripes which camouflage beautifully with the surrounding marsh roots. For five months, they’ll remain with the mother before finding their own ways. 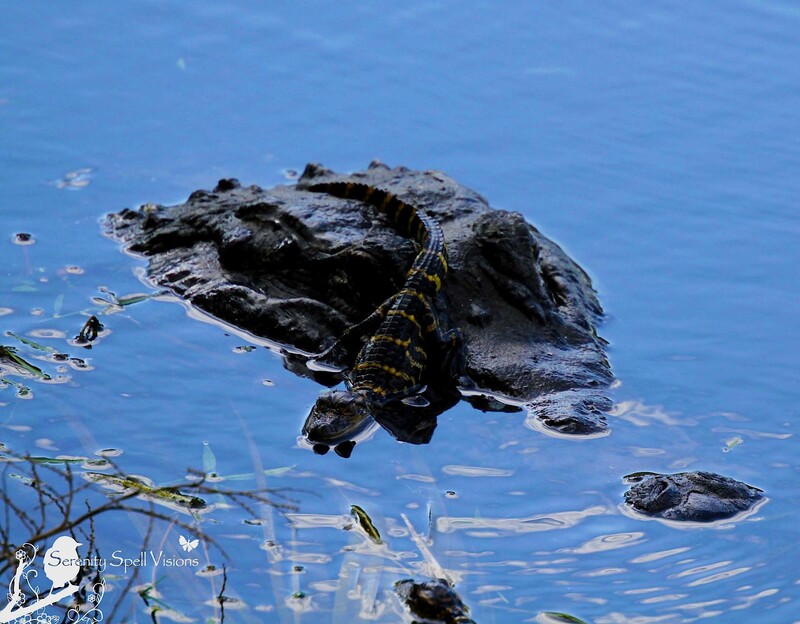 In our area, we typically see 5-10 baby alligators survive in the protected wetlands. Perhaps less. 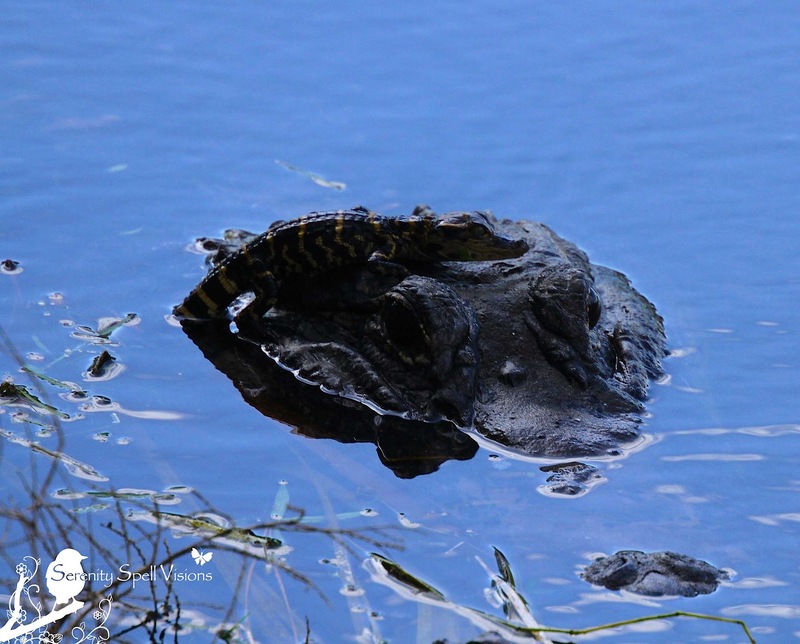 Common predators that prey upon the juvenile alligators include snakes, raccoons, bobcats, raptors, and even larger alligators. But for now, they’re being watched over by a very dutiful and observant momma…. One one of my two trips to Lake Martin, Louisiana, I had the opportunity to see baby alligators. I couldn’t figure out why so many trucks were parked along the road. When I stopped and got out, everyone started pointing. There she was, at the edge of a slough-like area, with nine babies on her back! It was the most wonderful sight – I love these detailed photos you’ve provided. What a wonderful post! 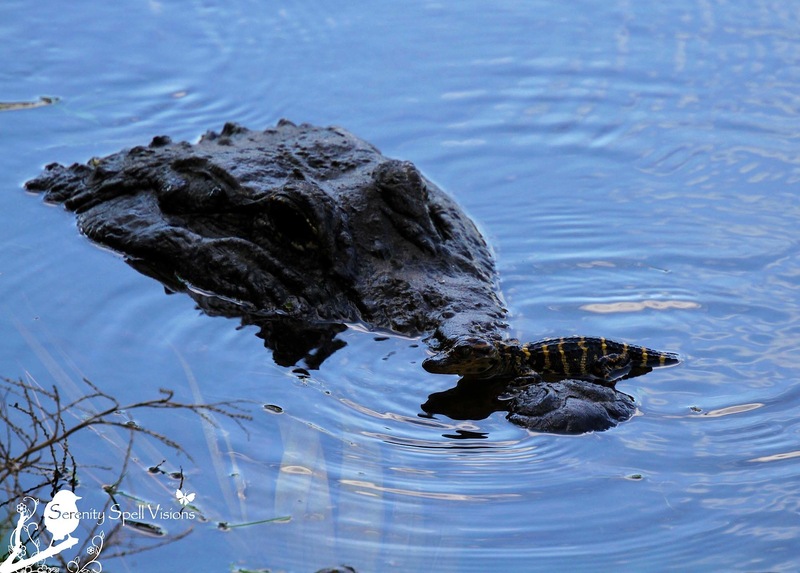 I’ve always wanted to photograph mama gator with her babies – hasn’t happened yet. Maybe soon! Welcome back! Thanks so much!! I’ve missed this space and everyone. 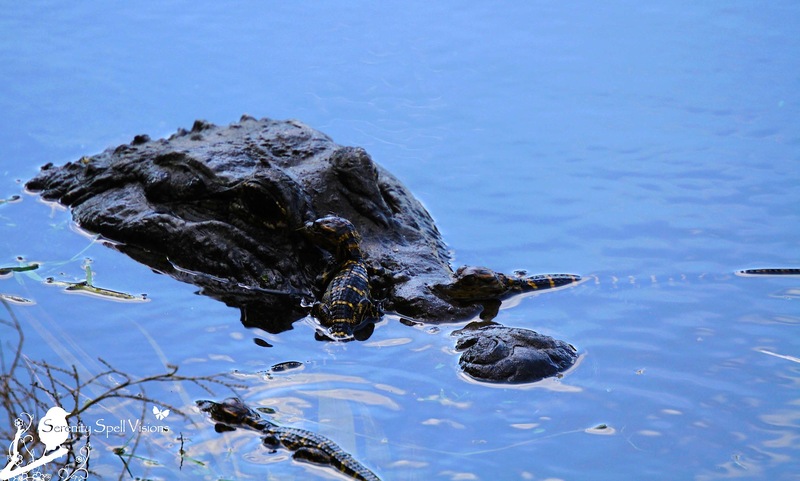 I’ve never seen a pic of a mama alligator with a baby! Thank you for sharing, Miss! You *are* your peaceful self and the Universe passed the word to her. Really. I’m very glad you’re back, too. I noticed your absence. Thanks! We worked together on it… Still considering using it here. Playing around! Wonderful photos. I know nothing of alligators, so thank you for the photos and enlightening words. We have encroached upon our neighbors’ habitats and the result is that they are disappearing. The balance has been compromised and a very large scale change is imperative. Thanks so much! I completely agree with you. If it weren’t for alligators’ protection, they’d be completely wiped out — they very nearly were, not that long ago. Amazing: the world’s oldest creature, nearly destroyed for vanity. I have absolutely no issue with people using my images for conservation (etc) work, but I was advised to go the watermark route by several other artists and photographers. I keep it low in the corner, though — not plastered across the image. So it’s a bit of both worlds! Welcome Back!! You were missed!! My fav is the perfect perch image. Maternal is not the first descriptor that comes to mind when thinking about alligators. Guess we think of maternal as warm, soft and pink, not scaly and prehistoric. But, the instinct to protect the next generation threads throughout the living world. And, keeping distance from the protective momma gators is generally the rule…they move fast and have teeth!! I’m convinced she gave me this opportunity to photograph her and her babies… So wonderful. But the gators are incredibly maternal! On our hikes, that’s when we know to be truly careful — when we see a mound, hatchlings, or when it’s breeding season. Otherwise, they’re not a threat. But I’ve seen a gator momma risk her life more than once to defend her nest from a male gator, moving her eggs multiple times… Poor girl. SUCH great mommas!! My mother grew up very poor in Lutz, FL and her only pets were baby alligators she caught and kept. Until they got too big! Somewhere there is a photo of her lying on her back with a Herk (they all say Herk, she told me) on his back on her chest – she said that if you turn them upside down and stroke their belly, they go to sleep. I never thought about how brave she must have been to get them away from Momma Gator! And this is why I’m not afraid of any beastie, my mom was awesome. Hee! I think the post would’ve hit eventually… I just got caught up in LIFE! That happens, eh? That’s so funny — What a wonderful story. I have a few friends with similar backgrounds, too! I was born in Florida, but moved when I was 4, returning 20 years ago. But my other Native FLA friends talked about raising native reptiles like it was nothing… Definitely a different world! I love on these new TV shows how big bad men wrestle juvenile alligators and act like it’s a scary thing — really? Why don’t you try for a bull gator or another grown-up? Why go for the babies?? Fantastic photos… I had to take a 2nd look to see that it was the mother under (it looks like a rock at first glance). Thanks so much! Gators really DO look like rocks or vegetation in the swamp / wetland waters — that’s their camouflaging! I was probably about 10 feet away from this girl, up on an embankment though. She knew I wasn’t a threat to her or her babies — and I knew it would take a bit for her to get to me. 🙂 When you’re accustomed to your area’s wildlife, you realize their patterns. But there are always accidents, I realize. Great shots, FeyGirl! I’ve only seen such sights at Wakodahatchee. Today, I was out at Apoxee Park on the perimeter trail (the loop end of the Owahee along Jog road, etc.). Saw several baby gators, but no mommas in sight. Saw a number of juveniles, too – looks like it was a good year for breeding. I caught a great shot of a 15 footer sunning on the bank at the M-canal foot bridge. Also got a GREAT shot of a bald eagle perched on a dead branch in the northern part of Apoxee! I love the Apoxee Wilderness Park! Lots of Snail Kites, Red Shouldered Hawks, and Red Tails today. And to top it all off, Air Force One swooped down low over me on its final approach to WPB as I was heading home. One awesome trip! Thanks so much! I’m trying to remember where these were shot, since I was out of the loop for a bit — they may have been Wako or Green Cay, though! I know there were 3 nests at Wako, so it was probably there. ARGH! I love GWP! We’ve hiked much of it, and just adore it… YOU ARE SO VERY LUCKY!! We’ve yet to see a bald eagle — but I know they’re there! I know the area has its share of snail kites (its logo! ), but we’ve only seen a handful. But we did have a great horned owl swoop in front of us once, heh. So the northern part of Apoxee, towards Owahee, eh? That will be our next trip. 🙂 We did part of Owahee but hit most of Apoxee once, then part of Owahee on the SWA side (really beautiful! ), as well as Hog Hammock, Eagle Trail, etc. On the Owahee / SWA side, I caught an orange anole — an odd / new variation! My posts on these trips are all over the place, but I’m in the process of compiling them under “Natural Areas” above. I’ll do that now… Sorry for the long reply, but I get very excited about our natural areas, obviously! Sorry I strayed so far from the topic of the day. I love your blog – and I love the Everglades ecosystem. Anyway, when you look at your map of the GWP, note the SE corner where Apoxee runs along the curve of Jog Rd. You will see that after a while, the border leaves Jog and heads north along the edge of a development. Most visitors don’t even realize there is a trail there – and it is as good as wetland trails get. Wear your wet shoes – you will be wading with your alligator friends until well into the dry season. Oh, please stray — it’s how I learn about areas I already love! I actually grabbed my map after reading your comment, trying to figure out where you were… I know there’s a trail along a development, but I don’t think we’ve done it. We did the stretch of Owahee that connects to the Apoxee trail from the rear (there was a lot of FPL work going on), and saw some AMAZING swamps — first-growth trees and all. THANKS again — I’d love to see your bald eage! Synchronous that it was the same day Air Force One flew over your head, eh? Great family shots! I don’t often see the babies with the parent like that. The photos of the baby alligators with their mom were awesome, and the post itself was very informative. Hope your trip to northern climes went well. Visiting family? And because I’m a techno-geek, I’m curious as to which OS you installed on your laptop. Yep, visiting family… Very busy times! The OS was just Leopard (or whatever the newest Mac update was) — but the bigger deal was Photoshop, which I’m only now looking at. Completely intimidating! At least I can insert a copyright. Wow. I have been using an open-source equivalent of Photoshop (called “GIMP”) for several years now. It was also completely intimidating at first. But I took it one step at a time and eventually learned how to correct the white balance, bring details out of the shadow, introduce additional contrast, etc. And with that said, there are still zillions of other things that I could learn. I’ve found watching YouTube videos to be a good way to pick up a few skills. You could subscribe to one of the channels dedicated to Photoshop and learn a bit at a time. That’s EXACTLY what I’ll be doing… I know of a class (through a fellow photog) that’s offered online, since I’m a very hands-on type. I need to be guided. I actually had Gimp, but only used it sparingly — that was equally intimidating! But the resources really should be learned, sigh. The Rookery Trail is awesome for birds AND Gators. How awesome for birds? If you fire up Google Maps, and center on the area of the Rookery Trail and zoom in (in Satellite mode), you can see THOUSANDS of white dots in the trees. Yep – so many Florida wading birds in those trees that you can even see them from space! It’s so wonderful they have this beautiful space. And every time we’ve been there, we’ve been alone! These photos are amazing and adorable — and I’m glad you’re back! Been missing you! Alligators are so very maternal. So protective of their nests and babies! I’ve seen them fight to nearly their deaths to protect their mounds. I had NO idea that baby gators perched on momma’s nose! What darling, dainty dinosaurs they are. I love that these animals have not changed for millinnea – that they are the reflections of swamps and jungles that are long gone. Aren’t they amazing? Very well said. Twenty million years in this incarnation… I’ve yet to capture a scene of a momma with her babies lined up on her back, though (I’ve seen it, sans camera). Now that’s a family portrait. 🙂 Many don’t realize how traditionally maternal these creatures are, both while the eggs are incubating and during the hatchling/baby phase. How absolutely adorable the little babies are ! Did you try to pick one up? Now that would be easy alligator wrestling. Wonderful story Feygirl. Aren’t they the cutest?? I love seeing babies — especially with their momma!! Pick them up… HAHAHAH! Lovely!….. and I just noticed your new logo. I love it!! There is nothing like sight of a mother (of any species) caring for her young..it always makes me misty eyed, as I am right now looking over your brillaint photos for the 3rd time! Such incredible shots! 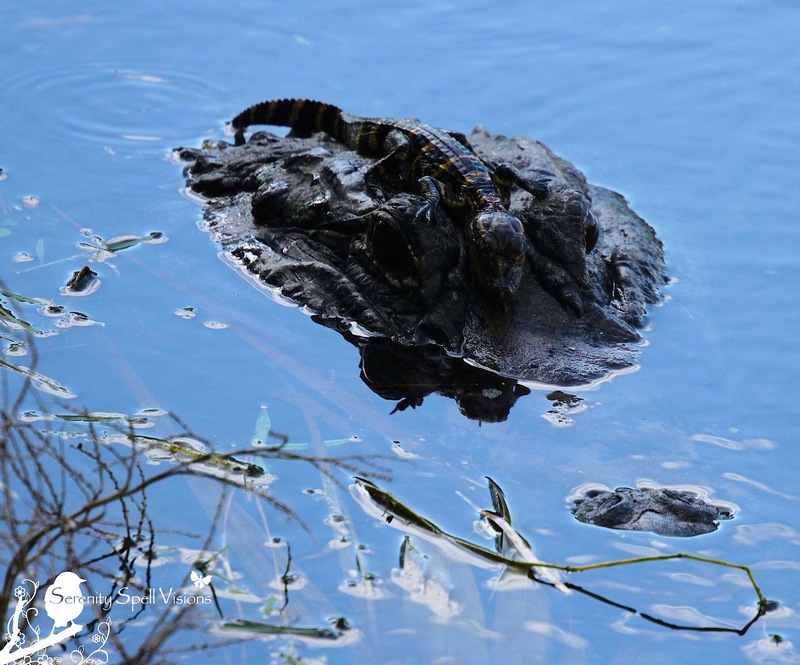 Many don’t realize how very maternal gators can be… Of course they are, they’re still mommas! I’ve seen some fight to near-death to protect their eggs and young. I was so very thrilled to stumble upon this gentle scene — so often the mother is watching her babies from nearby. Such gentleness! It really is a lesson for all of us. Fun shots! I had to look twice to see Mama. Also I like the new look. I was thrilled to stumble upon her, WITH her little ones! Two loves; birds & gators. You capture their essence perfectly. 🙂 🙂 Thanks for sharing. Heh heh!! I really missed this space and everyone’s amazing work. It’s wonderful to be inundated with such wonderful writing and imagery on a daily basis! You’re so kind though. I was SO thrilled. I often see baby gators, but the momma is usually nearby. So to see them together was a real treat — I like to think she was posing just for me. Of course, right? Aah! They’re cute, but I probably wouldn’t go up to one and tell him or her that. OOOOOOOOOO, I like your new look – the crocs too, of course – but the look is most fitting for new borns!!! YOU INSPIRED ME TO TRY SOMETHING DIFFERENT TOO – SO THANKS TO YOU TOO FOR YOUR COURAGE TO CHANGE!!! 🙂 Now to change on those *bigger* levels, hahaha!!! Magnificent animals, terrific pictures. Thanks for sharing FeyGirl!